I have not seen many Kamen Rider series, least of all Showa-era ones; as a result, any frame of reference I have for discussing the franchise is limited to select individual series rather than the franchise as any kind of whole. Nevertheless, I am currently watching Kuuga, and it is proving highly enjoyable television and quite watchable without any foreknowledge or wider sense of what one can or should expect. Taken outside of its franchise, it is a series that does superhero origins and self-discovery very well, and creates a world that realistically adapts to the sudden arrival of supervillains. It manages to be dark and atmospheric without necessarily being graphically violent or exploitative, in part owing to the understated creature designs and simple, easily-read hero suit. There is a formula to most Ultraman series episodes that initially seems repetitive and counter to the often weird and interesting setups; no matter what happens, there will be some kind of fight against a giant creature, because ultimately that is the franchise’s core motif. Indeed, the episodic monster-fighting nature of several entries may possibly seem different to viewers (like me) introduced to the franchise by the very interestingly continuity-driven Ultraman GEED. GEED had a shorter running time, and while it frequently had the giant fights to cap off episodes compounded with a veritable stable of heroes and forms, it told a fairly strong plot which itself tied into (in a fashion that used neat metatextual trickery) a wider cinematic universe. Ultraman GEED was the first series in the franchise I had watched to completion, and it proved consistently impressive – not least because of the enthusiasm and love the cast seemed to have for it, which came across very clearly in the performances. It was a series that managed to make something quite continuity-heavy accessible; by this point there is a fairly established Ultraman mythos, so to speak, and the relationships between the various heroes and villains are quite central to the main plot of GEED. Nevertheless, it used various different angles to make itself accessible to its family audience – if anything, Ultraman is interesting in the long-running superhero franchises because it is very focused on referencing and maintaining its canon, but at the same time doing so in a way that attracts, rather than puts off, new fans. Special Rescue Police Winspector (1990) is a series that regularly has me overreacting to its stupidity; it is gloriously over-the-top, often nonsensical in its approach to science and science fiction, and feels at times like it has perhaps two or three stock plots that are recycled in different settings. At the same time, though, I would absolutely recommend it to people looking for an entertaining and frequently plain daft superhero series. It may be stupid and contrived, even within the standards of its genre, but it is stupid in a very sincere and heartfelt way which manages – often enough – to make the viewer feel like they are laughing with the writing not purely at it. Concrete Revolutio is a series which is complex, holding the cards of its main plot close to its chest; eight episodes in it is hard to see exactly where the endgame will be despite Shin Mazinger-esque flashforwards showing some dystopian, uncertain future where alliances made during the main episodic plots seem inverted and the utopia that the heroes want to fight for has failed. It is clear from these main plots that the hoped-for utopia is based on a faulty premise, but there is the hope that the characters will realise this; each story has their faith in the world shaken a little more, but how this ties into a future where their actions are framed almost villainously is as yet unclear. This is fitting; it is a series about the people who control the image of, and perception of, heroism and justice. 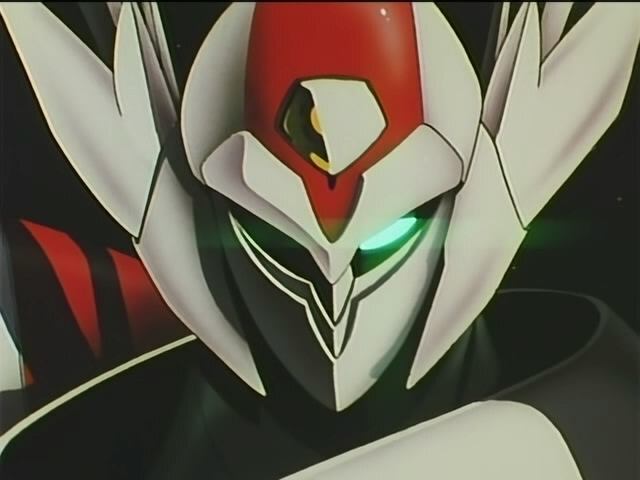 It is a series that calls into question the popular perception of justice, and it is perhaps for this reason I find myself comparing it repeatedly to Giant Robo. Tekkaman Blade, an animated series which aired between 1992-3, is technically a reworking of the 1975 series Tekkaman the Space Knight; it shares a basic concept of humanity threatened by alien invaders, and the superhero Tekkaman who fights them with his sidekick Pegas. Yet beyond this resemblance, the later series is very much its own story and is the series which has ultimately proved to have endured. Much changed between the two iterations, including the origin of the protagonist’s powers, the nature of his support crew and most significantly his design; the 1970s iteration drew on early tokusatsu live-action superhero costumes with its bright colours while the 1990s version uses many visual hallmarks of Masami Obari’s style (Obari himself worked on the detailed opening sequences) and is generally more angular and mechanical.